Welcome to Top Bar Tuesdays! This is the second post in a six-part series on top bar hive design. I was surprised to see how many variations there were for the basic shape of a top bar hive, and how little many authors discussed the different options, so I thought a few posts highlighting what I see as pros and cons of common approaches might be useful. This post looks at the body of the hive, in particular the end of the hive. When I search the Internet for top bar hive plans, I find instructions for building top bar hives from barrels, wooden boards, and even sunflower stalks. I’ve become interested, some would say obsessed, with what is the “best” design. After some research, more thought and a little too much math, I decided that some designs may be better than others, but the multitude of approaches appear to work just fine for both the bees and an aspiring beekeeper like myself. One key difference I see that is rarely mentioned is the available area for honeycomb. This made me wonder what type of TBH has an area similar to the standard Langstroth frames. Langstroth frames are so widely used that perhaps the size of these frames is relevant to or somehow preferred by the bees. So I sketched out the standard Langstroth frame shown here, based on a build-it-yourself diagram I found on beesource.com. By the way, I must apologize for all the math in this post. You can avoid this by skipping to the wrap up at the end, or indulge me as I share my recent calculations. What can I say? Math is fun. I also apologize for working in inches, as for some reason the U.S. is still using such archaic units of measurement. Crazy, I know, but I am a product of my culture so I use inches. Langstroth Medium Comb Area = 17 x 5.125 = 87.125 sq. in. Langstroth Shallow Comb Area = 17 x 4.25 = 72.25 sq. in. So, roughly speaking, if you want to match the comb capacity of a deep Langstroth frame, then a top bar hive should have an inner comb area of around 130 square inches. For the barrel hive design I mentioned previously, you may notice that half the barrel is used as the body of the hive. The area of a circle is pi (π) times the radius squared (πr2), so we can determine what size barrel matches the Langstroth frames. I’ll skip the details, but the result is that a barrel should have a radius of 9.3 inches to yield a deep comb area; and a radius of 7.4 inches to yield a medium comb area. This may mean that a barrel bigger than 19 or 20 inches in diameter is a bit large, as in addition to yielding heavier frames the comb size is larger than the comb produced by the deep Langstroth frames. Or perhaps the bees simply don’t use the whole area if the barrel is so big. I’m not sure. Interesting to ponder, especially since many plans for a top bar hive from a barrel recommend a 55-gallon food-grade plastic drum, which are typically around 23 inches in diameter (radius of 11.5). Let’s turn our attention to top bar hives based on wooden boards, since this is how TBH’s are often presented and sold (see for example Dadant or Aunt Bea’s). The end of such a hive is illustrated in the diagram. 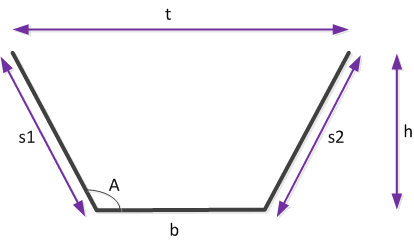 There are three boards: the base (b) and two sides (s1 and s2). In order to have a symmetrical design, not to mention a level hive, we really need s1 and s2 to be the same length. The sides are attached at the same angle (A) to the base board. The overall height of the hive (h) and the width of the top (t) are also shown. After looking at a number of sites, there seem to be two common designs that appear again and again. I call these the one-to-one design and the two-to-one design, based on the ratio of the sides to the base. The following diagram illustrates a somewhat idealistic view of each approach. In the first, the boards are all the same width, while in the second the sides are twice the width of the base. Note that the total width of the three boards in both hives is 30 inches (10+10+10 in the first; 12+6+12 in the second). 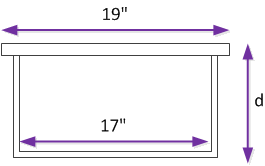 Two common approaches for building top bar hives from boards, the one-to-one approach on the left and the two-to-one approach on the right. Both designs have their advantages. The one-to-one design mirrors the shape and angle of the bee’s honeycomb, which is appealing to some folks, not to mention it provides a greater comb area, as we’ll see in a moment. It does have a longer top bar, which gives the bees more opportunity to curve the comb, which they apparently may do on a longer bar. Some proponents claim that bees are less likely to attach comb to the sides in this design, though other folks dispute this claim. The two-to-one design is a bit more compact, and the shorter top bar is preferred by some as it may encourage straighter comb. The more compact area may also retain heat better in cooler climates. One-to-One TBH Comb Area = 129.9 sq. in. Two-to-One TBH Comb Area = 113.94 sq. in. If you do the math, the 55-gallon barrel hive reaches this area in a mere 7 frames. For the one-to-one TBH you need 11 frames; in the two-to-one TBH you need 12 frames. With a smaller comb area on each frame, a longer hive is needed to achieve the same amount of comb. This could be important if a beekeeper is looking to maximize productivity, though I should mention that most authors agree Langstroth hives are generally more productive than top bar hives. With these numbers, we found that in order to match the total comb area of a 10-frame Langstroth deep hive, we would need 7 frames in the barrel hive, 11 frames in the one-to-one wooden hive, and 12 frames in the two-to-one wooden hive. I wonder if the different frame areas impact a hive’s ability to survive the winter, or the overall mood of a colony. This might be an advantage of the Langstroth stacking approach, as you end up with a larger overall nest area with two stacked Langstroth boxes of any size, whereas in top bar hives you can only make the box longer. I suspect that if you made a top bar hive the depth of a shallow or even a medium Langstroth frame the bees would find it too small, and would abandon the hive. In the next post of this series we’ll look at the impact of this discussion on some real-world designs for top bar hives. The title of this post makes me think of the plight of bees in our time. There is a great Ted Talk by Marla Spivak on this topic which is worth watching.